Refined, elegant and attention to all details are the distinctive elements of all our apartments. 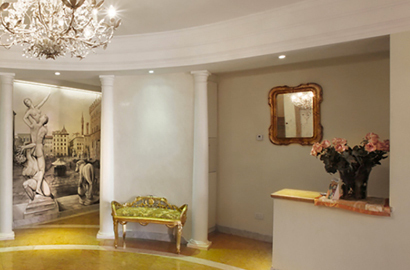 Villa Lucrezia is the only Apart-Hotel in Florence, with a complex of apartments and the same services as a hotel. Villa Lucrezia is created for those who “want to feel at home when being far from home” to “live” a vacation and not just to “sleep” in a hotel. Our apartments are all finely furnished, bright and spacious, each one equipped with wireless WiFi and digital and satellite TV. Villa Lucrezia is the ideal accommodation to visit our beautiful Florence. Sober lines, functional furnishings, contemporary nuances: our apartments are the perfect solution to have everything in your room. Recently renewed, it's our flagship to guarantee you a pleasant stay in total comfort. There is a large double bedroom, a well-equipped hidden kitchen, a dining table, a comfortable sofa and a large wall-mounted wardrobe. The private bathroom with shower, offers a courtesy kit and hair dryer. Relax corner in the patio designed for you to share a drink with whom you love. Connect you devices to our high speed Wi-Fi and use it easily from your room. All our apartments have an independent air-conditioning and heating system to make your stay more comfortable. Hungry? In all our apartments you will find a well-equipped kitchen to cook by yourself whenever you want. And it is free!